Make the crust. Position a rack in the middle of the oven. Heat the oven to 325° F. Butter a 9-inch square baking pan and line the pan with a piece of parchment paper that is long enough to extend over two opposite side of the pan. Butter the paper. In a medium bowl, stir the crumbs and melted butter together until the crumbs are evenly moistened. Stir in the chocolate chips. Press the crumb mixture evenly over the bottom and 1-inch up the sides of the prepared pan. Bake for 6 minutes. Transfer the pan to a wire rack. Leave the oven on. Make the dough. In a large bowl, using an electric mixer on medium speed, beat the butter, brown sugar, granulated sugar, salt, and vanilla until smoothly blended, about 1 minute. Decrease the speed to low and add the flour, mixing just to incorporate it. Stir in the chocolate chips. Set aside. Make the filling. In a large bowl, using clean beaters, beat the cream cheese and sugar on low speed just until smooth. Mix in the egg and vanilla, beating just to blend them in. Put the 1/3 cup chocolate chips in a small heatproof bowl or the top of a double boiler and place it over a saucepan of barely simmering water (or the bottom of the double boiler); the water should not touch the bowl. Stir until the chocolate chips are melted and smooth. 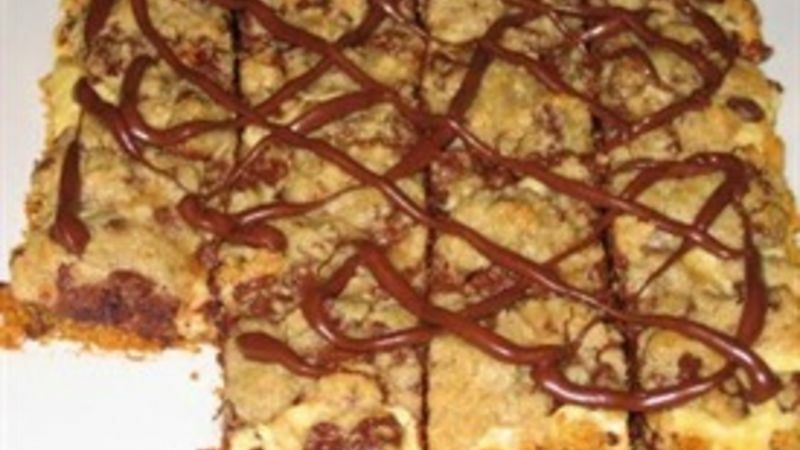 Use a teaspoon to gently drizzle thin lines of melted chocolate over the top of the bars. Cool the bars completely in the pan, about 1 hour. The chocolate topping will be set when the bars are cool. Loosen the sides of the bars from the unlined sides of the pan and use the ends of the paper to lift the bars from the pan. Use a large knife to cut the bars into 16 pieces, wiping the knife clean as needed.